10. Learn-at-home DVD martial arts courses. Can't get to the dojo? No problem. Earn your black belt in the comfort of your living room. Really. 9. Extreme or Tricking martial arts. These are strictly demonstration arts devised as crowd pleasers. Competitors perform quasi-martial art routines based on acrobatics interspersed with enough karate shouts to give you a headache that'll last a week. 8. Far-fetched breaking routines. Breaking slabs of wood with a shuto (blade-hand) or kick can be a viable way to measure striking efficiency. Sometimes it gets to be a bit much. A friend of mine used to set bricks on fire before busting them apart with a hammer fist at demos. Nice. Once, I watched a competitor on TV attempt this same trick, but somehow some of the lighter fluid ended up on the floor, igniting the mats and setting the entire venue ablaze. Also, is being able to break a fifty inch-thick chunk of ice with your forehead indicative of any combative skill? Talk about headaches. Still, playing with ice is safer than fire. 7. Training uniforms that are so patched up they resemble a billboard. Some of these jiu-jitsu guys look more like race car drivers. 6. Camouflage belts. When colored belts were introduced in judo over a century ago, there were just white, brown, and black. Much later, more incremental colors were added to appease the masses. Not a bad idea. I can tolerate yellow, orange, etc., but camouflage? Come on. 5. The "my style and only my style is the ultimate fighting system" mantra. Please shut up already. 4. Gossip in the dojo. I don't care what Jane or anyone else does with their life. It's none of my business or yours. Few things are more damaging and hurtful (and cowardly) than malicious trash talk behind someone's back. Definitely shut up. 3. People who think they can develop as martial artists without hard work. Real martial arts are both an intellectual and physical pursuit. Deal with it. And there you have it. Granted, some of these items are more amusing than annoying. Did I leave anything out? Let me know. I'd add to that list people who can't seem to tie the belts! This used to drive me nuts at tourneys. Especially those who were high belts or black belts! Also another tournament pearl: Fat out-of-shape black belts. Yeah they may have knowledge but damn! We had at least two from other schools that made everyone look bad. My old sabum used to crawl out of his skin at seeing camouflage belts. I was hoping never to hear of gymkata again, but it certainly belongs on this list. 10 year-old 4th dan. Only slight exaggeration. I've actually seen or heard of a good number of 2nd dans who aren't even close to puberty. I agree with you John,but coming from a conceptual martial art system, I don't care about the belts (or color there of). And yes there are some bad moves out there. I was at a seminar once where Bill "superfoot" Wallace was teaching. I told him I enjoyed his films, he asked me what it was I liked. I told him it was watching technique (even if choriographed). As to board breaking, makes a nice show! My pet peeve ... Instructors who think the world of themselves and who only see one way to do/teach/interpret anything. Drives me nuts. Some humility and objectivity goes a long way! That's a pretty good list - how about this for another one... "a student that interrupts every demonstration or discussion with, "Well, what if..."
This is great, but wait, are you channeling me or something? That post had some serious attitude. Oh, and the only thing you're missing is the old "master" who hits on young girls. That's fairly annoying too. Ha, the ol' what if. I should've included that one. Yes, I've been working hard on my channeling and attitude. It's what I'll need for my next promotion. Is the testing done online? While I appreciate the skills needed for tricking, gimme a traditional style kata with appropriate Kia. Oh, and lose the Mortal Kombat soundtrack, please. If it don't look good with the sound turned down, it ain't good. I wholeheartedly agree with number 1...definitely the most annoying thing for me. Great post, and a great list. I also dont like hearing people refer to certain arts as traditional and others as modern. Mainly people see MMA as modern, but fail to realise that the exact techniques which are used come from so called "traditional arts"
Great list. Personally, I do not like seeing martial arts weapons adorned with glitter, metallic tape or colorful fringes. Hmm, I dunno. Probably. I think for black belt you should be able to use the DVDs as weapons. Kind of like throwing stars or something. That's about all they're good for anyway. I've experienced that happen a couple of times. The last place I trained at you never saw the chief instructor. Then he tries getting me to teach on Saturdays. I told him I don't do weekends, then I left. Mainly people see MMA as modern, but fail to realise that the exact techniques which are used come from so called "traditional arts"
In a way, MMA is ancient; it's the traditional stuff that's modern. 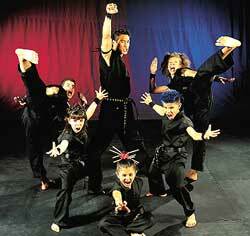 Give it time, soon you'll see signs that read "WE TEACH TRADITIONAL MMA." Personally, I do not like seeing martial arts weapons adorned with glitter, metallic tape or colorful fringes. Same here. This guy from my old dojo used to look at catalogues at these new-fangled weapons. Bo's that were made out of teflon or something synthetic. All these wild colors too. I told him that I really doubt any self respecting dojo would even allow these things past the door, let alone let you test with them. Speaking of bo's, I have one made of rattan (supposedly not traditional Okinawan) that they wouldn't let me test with for shodan, but for nidan (different school and organization) it was okay. Go figure. You don't have a mullet? You're out!! Seriously, gymkata is a ninja busting out! I love this list so much, I just might put something of the like in our journal. Don't worry, I'll ask permission before doing so. Nah, you don't need permission to copy that list. And face it, you know Gymkata is the greatest MA flick of all time. You're just jealous because you can't knockout six guys at once while spinning on a pommel horse. Hoo-ya! me personally, i really annoyed by the higher belt people who cant seem to do the techniques they should know. Such as black belt who cant do a proper sidekick, or a red belt who cant break a single board with a back kick. it just pains me deep inside.